After years of making it clear that I'm not a developer in just about every article I've written here at Linux Journal, I do have a confession to make. I can write the "Hello World" equivalent in almost every programming language out there. In assembly, it might have been "1+1", but my lack of advanced skills should be evident. The thing is, I've always wanted to learn how to program, but I hate the process so much I never get past "Hello World". I know PHP is no longer cool. I know that compared to Python it's extremely limited. But I also know that with PHP, I actually was able to create useful programs from the beginning. I suspect that's why I love Bash scripting so much. With Bash, I always start with a problem to solve and use scripting to solve it. I never "learned" to write Bash scripts, I just did it. My goal in this article is to throw you right into writing useful PHP code. If you really want to make "Hello World" appear in a browser window, by all means do so. But I'm not going to teach you how! One great thing about PHP is that just about every Web server has it installed and ready to go. If you get advanced and want to start making system calls to the underlying Linux OS, you might have to tweak php.ini a bit, but getting a PHP platform is usually as simple as installing a Web server with a LAMP stack. One thing that makes programming easier for me is to make sure my user account has write access to the place I'm writing code. My process usually involves making a small change and clicking refresh on the browser to see if it worked. If you have to sudo cp localfile serverfile every time you make a change, it will be no fun. Worry about proper file permissions when you release your code to the Internet, but not while you're developing. It took me a little while to understand this concept, so I'm going to explain it quickly. PHP code can be added to standard HTML, or it can be strictly PHP code that creates HTML as output. These following two snippets of code do the same thing. Feel free to copy that into two separate PHP files and browse to the page. You should see something like Figure 1. The reason I spelled this out is because different people code PHP in different ways. Just remember that if it's not inside a <?php ?> container, it is treated like plain-old HTML. Anything inside those <?php ?> containers are executed, and the output is sent to the browser window. Often, PHP code won't have any output, and so nothing is displayed on the screen. But, if you want to use PHP, it must be inside those tags, namely: <?php PHP STUFF HERE ?>. Figure 1. It's not "Hello World", but I'll admit, it's dangerously close. I created a simple landing page in PHP. (Figure 2 shows its output.) You can download it at http://snar.co/ljphp. It's also shown in Listing 1. Unzip the file, and put it in your Web server so you can edit it and make it work for you. Figure 2. This is the portal. Your family probably will be less silly looking! Notice the first line has <?php in it—that means it starts with a section of PHP code rather than HTML. The first thing you do is load a weather API into a PHP array. You'll need to register on Wunderground to get your own API key (they're free), and then modify the URL to fit your location. Basically, it's a two-step process: you load the JSON string into a variable called $json and then use the json_decode function to break that apart into an array. Check out the Working with Arrays sidebar for some tips on looking at the array itself so you can see what it contains. After that little bit of variable work, the PHP section closes with a ?> on line 8. From that point on, it's mostly HTML coding that should look fairly clear. Basically, I created a simple table. In the first cell, there is a picture of my family (you can add your own fam.jpg to the same folder where the php file lives), and then I open another section of PHP code. Here I print some of the information from the Weather API. You can figure most of it out, but of particular note are the periods in the echo statements. If you want to print more than one thing on the screen, put a dot in between them outside the quotation marks. The last section of the PHP document does a really cool PHP trick and executes a local shell command, dumping the output to the browser screen. 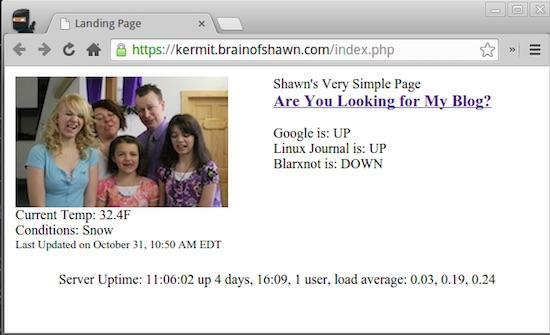 So the results of the uptime command are printed at the bottom of the landing page. If you have a Windows server, it probably will just error out, but I'm assuming we're all using Linux here. Reading and writing files on the system. PHP coding is incredibly fun. I can't believe I'm saying that, but it's true. If you love Bash and can't imagine living without it, I suspect you'll love PHP, because it's a lot like Bash, but a Web browser gets to be the input/output mechanism! If you'd like me to do more project-based learning with programming languages, please let me know. I'd love a reason to come up with fun projects, but it only makes sense if everyone wants to play along! When you load this page, it should display the entire array in an easy-to-read format in your browser. The <pre> tags are important; otherwise, it just jumbles the output all into a single line. Whenever I'm trying to figure out the contents of an array, I make a quick PHP file like this so I can look at it. Hopefully, you'll be able to find the variable indexes, and it will make sense.